Munchkinland isn’t the only place with a Lollipop Guild, but Italy’s Lollipop Guild isn’t here to welcome you; they’re here to stop you. 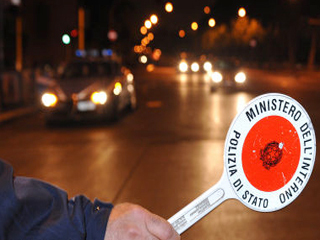 Italian police use the paletta del poliziotto (which resembles a giant lollipop) as a signal for drivers to stop. The paletta is a metal or plastic circle, about ten inches (25 centimeters) in diameter mounted on a stick; one side is red, the other green. Police keep them handy, attached to the doors of squad cars. Spiffy motorcycle cops tuck the lollies inside their boots, making them easy to grab. I’ve seen bicycle troops with the paletta sticking out of saddlebags, and while I haven’t seen them, I suspect the Venetian version of motorcycle patrols use them as well. 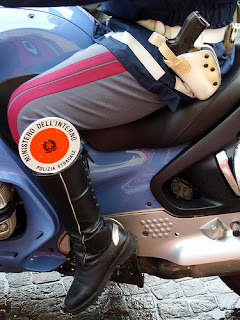 Italian motorists, and even pedestrians, know the paletta means stop. Squad cars, sirens wailing, swoosh through intersections with a cop holding the paletta out the window. To the uninitiated, that little circle of red may go unnoticed, but you ignore it at your peril. The police officer with the lolly has the right of way. Fortunately, the sirens are a better signal for most tourists to Italy. There can be perils for the police, as well. A couple of years ago, a police officer saw a motorist trying to pass another car on a dangerous stretch of road where passing was prohibited. The officer stuck out his paletta to stop the car. It was traveling too fast, and the side mirror of the car struck the paletta, wrenching the officer’s arm and breaking his elbow. The paletta is also sometimes used in crime. Thieves armed with a counterfeit paletta target cars with foreign tags. In one recent case, such a thief stopped a French man driving a camper. Once the driver opened the window, the thief ordered him to open up the back of the van, which he planned to strip of its valuables. This tourist was lucky. Real police officers came upon the incident. The thief tried to hide his paletta falsa under his jacket, but he was apprehended and the French man went on his way. In another case, two men impersonating police officers stopped a van carrying three Hungarian tourists, using a counterfeit paletta. One of the tourists became suspicious and asked to inspect the police credentials. This trio enjoyed good fortune as well in that Caribinieri came along in time to interrupt the thieves and take them into custody. Please join me on alternate Thursdays at Novel Adventurers. Next week I'm writing about one of my favorite Italian treats. Fascinating as usual. Thank you for sharing your life in amazing Italy. Thanks, Kath. I've been thinking of writing about the lollipops for a few years. Recently, I realized that I didn't know the official word to describe the device. I looked up "lollipop" in a bilingual dictionary and discovered that it translated! My manual for the drivers license gives the really official name: segnale distintivo (distinctive signal). On an Italian language internet forum, someone wanted "paletta del poliziotto" translated into English. The writer was surprised to discover that we don't use them in England or the US. I'm glad to be of service. I try to provide information about life in Italy that can be useful to people who come for short visits. I have always been rather taken by these lollipops. There is something pop art about them, sort of Alice in Wonderland about the oversizedness of a lollipop. Thanks for this information, Patricia. I have always wanted to know. Estelle, thanks for your comment. I've always been fascinated by the lollipops. It now amazes me that my private word "lollipop" is general. I suppose I'm not so inventive, after all.